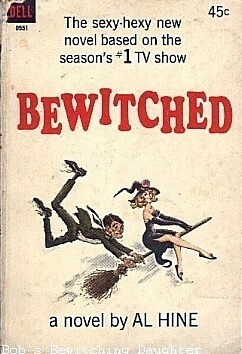 Bewitched novel. 1965 Al Hine novel Bewitched based on the tv show; very collectible. I was lucky to have bought a copy from an ebay seller in Salem (no joke here! )a few years ago for only $10.00. Wallpaper and background images in the Bewitched club tagged: bewitched elizabeth montgomery samantha stephens collectibles. Excellent,this item must be rare hope it pays dividends for you if not its a great keep sake. No, I don't think I would ever buy this book. It's not entirely canon.